Sign up here and you’ll get an e-mail daily (through 12/13/09) with a great new offer from Step2! 1. Early Access: this offer will be made public on 12/4/09. As a valued email subscriber, you are eligible for this pricing right now! 2. This offer is valid One Day Only, and expires on 12/4/09 at 11:59 ET or when inventory is depleted. 3. 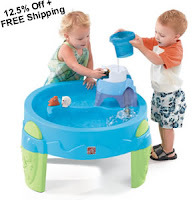 You must enter the promotional code: SPLASHDAY during checkout to qualify. 4. This promotion is NOT valid on prior purchases, is limited to available inventory supply, and cannot be combined with any other offer. NO EXCEPTIONS. 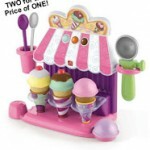 Step2: 12 Deals in 12 Days Ice Cream Parlor 2 pk for $19.99! 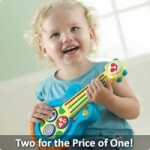 Step 2 Deal of the Day: Basic Rhythms Guitar (2pk) for $19.99! 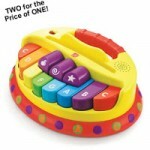 Step 2 "12 Deals in 12 Days" – get the Basic Rhythms Piano (2pk) for $19.99!